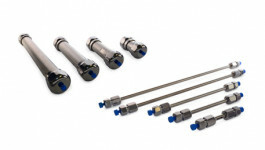 SiliaChrom Plus Diol columns are ideal for difficult separations of low to medium polarity samples. They can be used for sugars analysis (carbohydrates, glycosides and oligosaccharides) and vitamins analysis. SiliaChrom Plus Diol columns are also compatible with HILIC mode (Hydrophilic Interaction LIquid Chromatography).